The wide-spread use of bottled water is a major ecological problem. Now a company is using branding and celebrity endorsement to make bottled water seem cooler to kids. Hopefully most of today’s younger people are learning enough about the true ecological situation that they won’t fall for this foolishness. Bottled water does not have to pure. Independent tests have shown that often it is only tap water filtered to improve taste and odor. Some has been shown to contain contaminants. 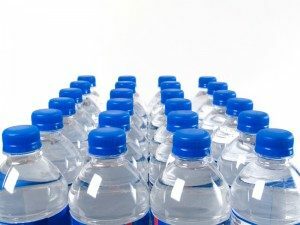 Bottled water uses an enormous amount of plastic. The production of these plastics use resources and introduce eco problems. And the numbers of plastic water bottles that end up in piles of waste is huge. Bottled water is trucked all over the place. This adds to wear on the highways, helps pollute the air from exhaust and increases global warming. And these things add up to the fact that you end up paying several times the actual value of the water just to get it in a small bottle. Get your own filtering bottle. And/or get a filter for your kitchen and fill your own bottle. Do it for you own health, your family’s health, and the health of the planet.